Nature is a massive relay race, endless and cyclical; numerous plants run the length of their season, overlaps occur as others start theirs, the batons are passed and off go the next group. What a wonderful, fertile world it is and as foragers we are placed, probably better than anyone, to watch this marvellous and never ending event, not only the big picture, but all the tiny details, the subtleties, the changes and shifts from year to year, season to season, week to week, even day to day. Lucky us! This month sees our fruit and nut trees in overdrive and although as the Summer turns to Autumn, it’s hard for me to focus my attentions on anything not mushroom related, I have devised five new recipes, tried to find some original ideas, or at least adapt old ones. Necessity may well be “the Mother of invention” but availability plays a big part too, especially when we apply this thinking to harvesting and using wild food. All the recipes below should be used as a starting point for further creativity with ingredients mixed, matched and replaced depending what’s around at the time. I hope this gets you thinking about alternative uses for our edible Autumn trees and do please let me know how you get on. September : A thick, sweet Elderberry glaze for meat, fish or ice cream (yes, really). I can’t think of a tastier, more versatile Autumn berry that this and the foraging year also gives us a myriad of wonderful Elderflower recipes earlier on. This one is basically a reduced and sweetened version of an Elder vinegar and would benefit, or at least vary, if made with a 50/50 mix of Elderberries and Blackberries. Combine a litre of white wine vinegar with 7-800g of Elderberries, removed from their stems using a fork, then leave in a large jar for 5 or 6 days. Strain the liquid and discard the berries before adding 1kg of sugar (yes I know it’s a lot but we are aiming for something thick and sweet here) and simmering for ten minutes. You can bottle it at this stage and you have the most fantastic vinegar already….to make the glaze, carry on reducing it for another twenty minutes or so until it has about half its original volume and is a lovely sticky consistency. Make a big batch and kid yourself that you’re going to give some to your friends. October : Blackthorn Pacharan with vanilla and coffee. 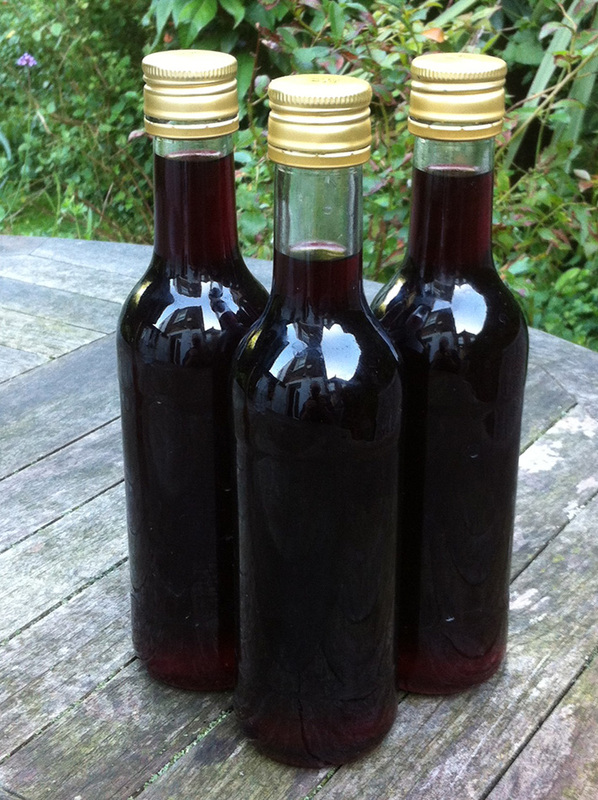 I should have just said Sloes but I think Blackthorn Pacharan sounds so much nicer. This recipe comes from the Basque region of Spain and is made with any aniseed liquor, Raki, Pernod or Ouzo will all do fine but for my version I use half a litre of one of these and half a litre of vodka (I’m such a cheapskate). To this I add about 300g of ripe Sloes and leave to infuse in a big glass jar for a couple of weeks, before adding 3-4 tbsp of sugar, a stick of cinnamon, a dozen coffee beans, orange peel and chamomile flowers for the traditional version or vanilla pod for my twist on it. Leave it somewhere dark for at least a month, giving it a little shake every few days. Strain through muslin and bottle it. Roll on Christmas. Also works very well with Elderberries, but most things do. November : Sweet Chestnut Pate with Field Blewit mushrooms. As with all my cooking, nothing is that exact and the quantities and ingredients vary dependant on my mood and their availability. 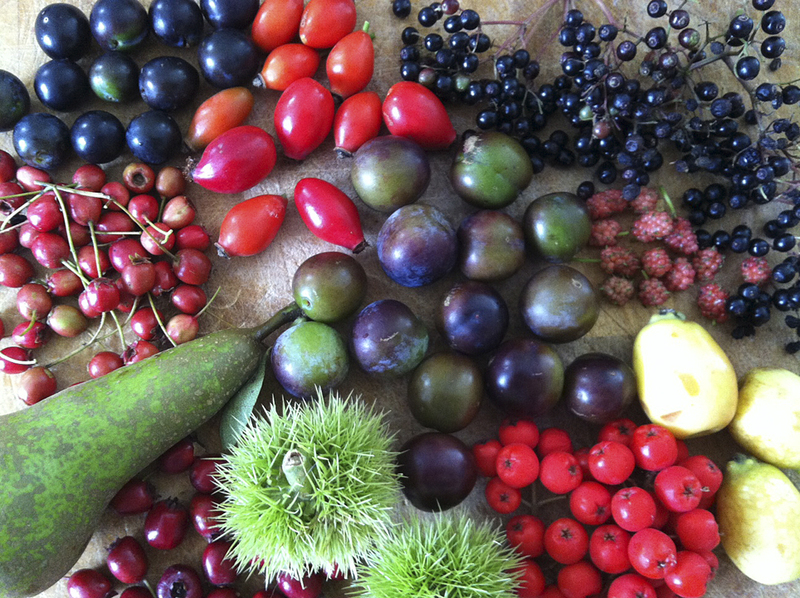 Last year, fuelled by a sodden Spring and a scorching Summer, most of our fruits and nuts went into overdrive, not just in quantity but in size. The Sweet Chestnuts I was picking were almost as big as the ones we import from Europe. Fingers crossed for another bumper crop. 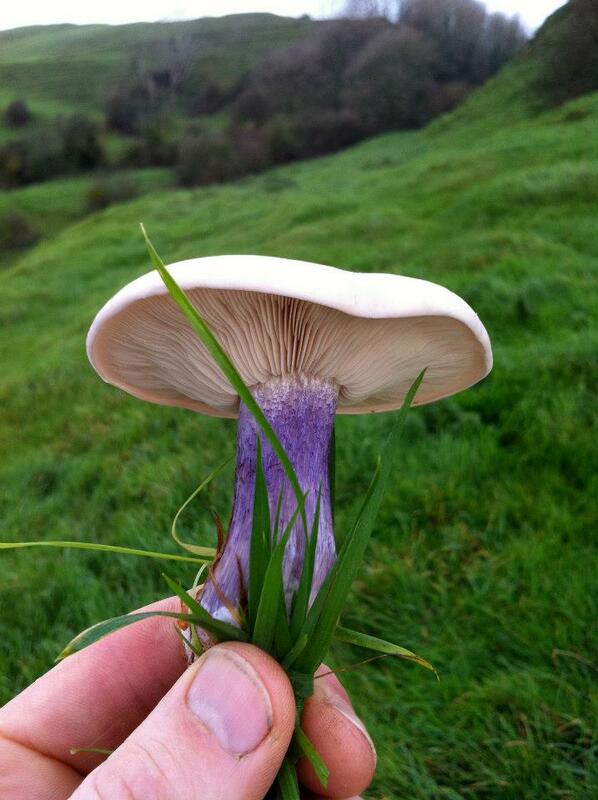 About the same time of year, the wonderful Field Blewit mushroom starts to pop up, stunning to look at, sweet smelling and with a lovely fruity taste, the obvious partner for a nutty mushroom pate. Although any decent wild mushroom would do the job, these seem to work particularly well ( as do the bright blue Wood Blewits) but if you are not 100% sure you have the right thing, DO NOT PICK IT ( SHOUTY VOICE), PLEASE. So, the recipe; chop and gently fry an onion, then add about 300g of mushrooms and a few pinches of Marjoram (wild or otherwise), cook for just a couple of minutes. At the same time take 200g of Sweet Chestnuts, halved with the shells on (or not if they are out of a packet…Boo!) and boil for about ten minutes before removing the shells. Whizz 200g of cream cheese and a tbsp of white wine vinegar in a blender, then add the nuts and the mushroom/onion mix and some black pepper. Blend gently until it makes a smooth paste, taste and season as required before putting the mixture into a dish and into the fridge for a few hours. Alternatively, cook the Sweet Chestnuts for just a couple of minutes and go for a more textured version, although, as you will find, removing lots of them from the shells hurts the hell out of your finger nails..but its worth it, it really is. December : Savoury Acorn pancakes with wild herbs. 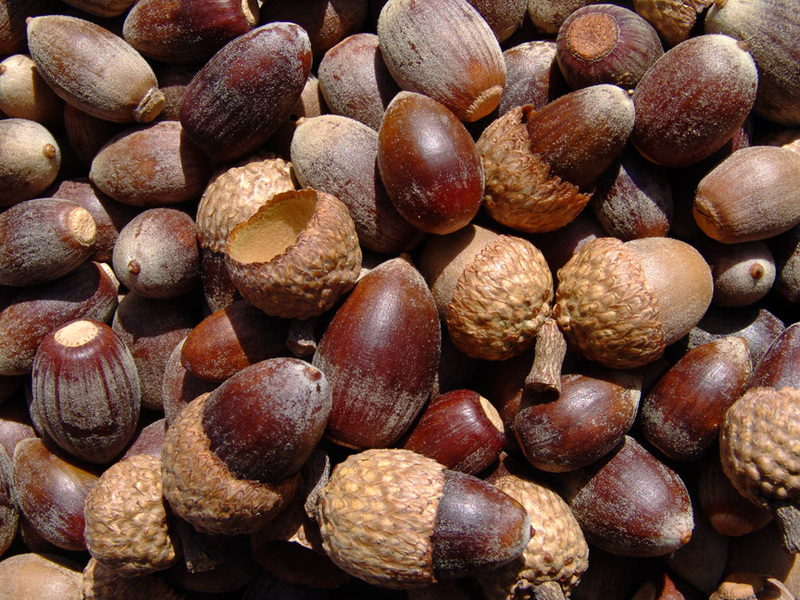 Of all our under utilised food resources, Acorns must be at the top of the list, considered more of a famine food or a pig feed than anything. The problem with Acorns is not their flavour, delicious once correctly prepared, it’s the effort involved in getting them to reach this stage, removing the tannins that make them initially so bitter, a time consuming process that modern life really doesn’t leave much room for. However, I spend time digging up the roots of many of our native plants, not because I have to but because their taste is unique, wonderful, steeped in history and a genuine form of Taste Bud Time Travel. The effort is matched by the experience and the same applies to these amazing nuts. Google Acorn flour and see if you can buy any in the UK…good luck…you’ll just have to make your own. So, Stage 1. Removing the tannin and making the flour..Over to Nancy at naturepods.com in the US…. https://www.naturepods.com/steps-to-make-acorn-flour Well, that’s the tricky bit out of the way, so onto Stage 2. Mix one cup of acorn flour with one cup of plain flour, then add a tsp of salt, 2 tsp of baking soda, black pepper and crushed wild herbs ( Marjoram, Thyme, anything else you fancy). Next add two eggs and two cups of milk and mix it all thoroughly. Tweak the milk to flour ratio if needed then fry in a good pan as you would with any other pancake mix. Goes especially well with eggs and foraged mushrooms. January : Crab apple fruit chews with sea buckthorn and star anise. These are often called fruit leathers but I don’t really like the name, it suggests something that’s hard work to eat, when actually these are the most delicious, fruity and tangy sweets. What’s more they’re actually good for you. I tend to mix and match the ingredients based on what I find, sometimes making them with just a small handful of numerous wild fruits…mulberries, elderberries, sloes, crabs, then maybe adding a couple of plums from my local shop or any fruit at home that needs eating. 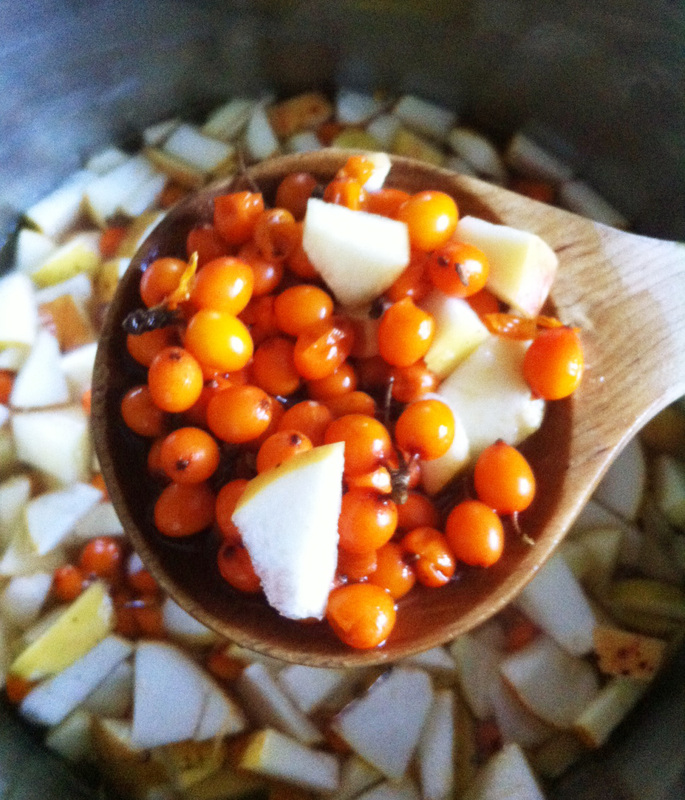 Crab Apples are a fantastic source of Vitamin C and other Flavonoids (anti oxidants). They’re also jammed full of malic acid which helps digestion and is brilliant at aiding detox of, amongst other things, heavy metals. There are numerous varieties of Crab Apples and I often find huge patches of windfalls right through the winter. Sea Buckthorn also has copious amounts of malic acid and an amazing taste like Orange meets Lemon with the flavour volume turned up to maximum. Picking Sea Buckthorn can be fun; exploding orange berries and super sharp thorns, but despite its name, I find this terrific wild food growing in various city parks, often with fruit as late as mid winter. Combine both these extreme fruits and you have some truly amazing nibbles. The recipe is simple, just chop your fruit and add half a cup of water for every four cups of fruit, add a couple of star anise, cinnamon too if you fancy and simmer it all for about 15 minutes until soft before giving the mix a good squash with a potato masher. At this point I add some sugar to taste but better still use xylitol, a much healthier fruit sugar (a lot sweeter so much less is needed) and carry on cooking for another 10 minutes or so before removing the anise stars and putting it all into a blender. The aim is to get a smooth paste so if you find the mix is too thin, blend half a banana in to help it stiffen. Lastly the mixture needs to be smeared, no thicker than 2-3 mm, onto sheets of grease proof paper and dried in a very low oven for 8-10 hours unless you are lucky enough to have a dehydrator in which case it takes less time and uses a lot less power. Cut the finished chews into strips and store in a tin. They also keep very well as full sheets, folder up in the paper and put in the freezer. the cooked mixture also freezes well at this stage too. Hello, thanks for the inspiring recipes. 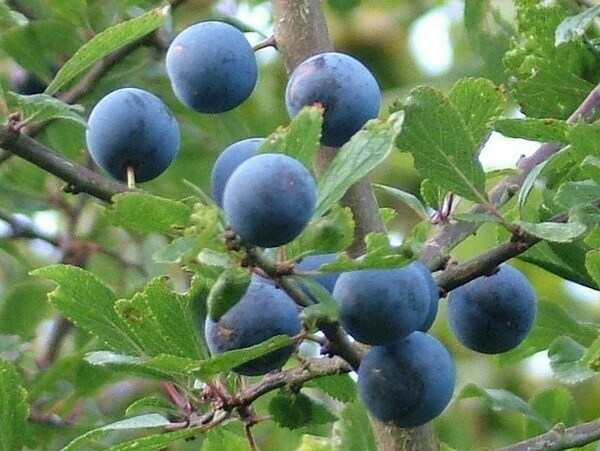 I am keen to get out there and forage , but where can I find sloe berries? Next post: Learn to safely ID these 4 late season wild mushrooms. Previous post: Learn another 100 edible plants in just 10 minutes?